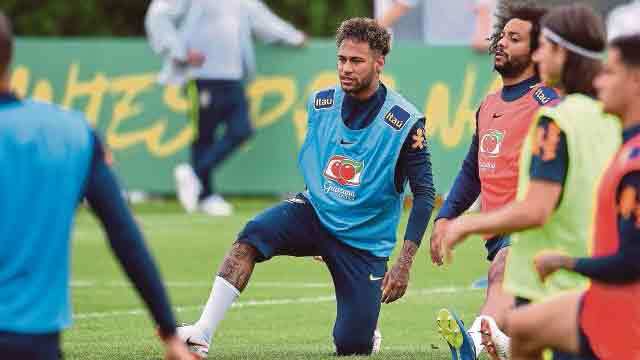 Dhaka, Jun 2 (Just News): Brazil will keep a close eye on the fitness of star striker Neymar when the World Cup contenders face Croatia in a friendly at Anfield on Sunday. Neymar, who scored four goals in the 2014 World Cup, has not played any form of football since February after breaking his foot. The 26-year-old Paris Saint Germain ace sat out training on Thursday as a precaution. But his Brazil team-mate Fernandinho has given a positive assessment of Neymar’s condition just two weeks before the start of the World Cup on 14 June. “By the movements and dribbles he has been doing in training, he has shown he is well,” said the Manchester City midfielder. “He is confident which is important, he shows that he isn’t scared of our defenders as he takes them on without fear. “This is the first steps to getting his confidence back to 100 per cent for the World Cup. “We also support his recovery because without a doubt he will be the difference for our team. “I’ve been in his position when I was younger, being injured isn’t easy even when getting back from injury doing daily workouts even when the bone is still hurting is still difficult. Neymar could play some part as a substitute at Anfield, but Selecao boss Tite is unlikely to take any unnecessary risks, with their opening World Cup fixture against Switzerland looming on 17 June. That said Neymar must surely have some game-time, with a friendly against Austria in Vienna on 10 June serving as Brazil’s other warm-up fixture. Brazil, five-time world champions, have spent the week training at Tottenham ahead of their opening World Cup warm-up fixture. The match with Croatia gives the Liverpool crowd the opportunity to see former Reds star Philippe Coutinho. Brazil forward Coutinho left Liverpool for Barcelona in January, while his international colleague Roberto Firmino will also be hoping to feature on his home club ground. It is uncertain what kind of reception Coutinho will receive, with Liverpool legend Kenny Dalglish this week requesting the “boo boys” to stay away from the match. “We haven’t had that conversation about Philippe returning to Anfield,” Fernandinho said. “But I believe he’s happy because he spent a couple years at Liverpool, had some fantastic games where his performances managed to take him to Barcelona and the Brazilian national team. Brazil have an injury doubt over Renato Augusto and he is likely to miss Sunday’s fixture due to a right knee issue. But Brazil’s squad has had a relaxed feel to it this week ahead of the more serious work. There is a sense of wishing to right wrongs of the past, with the 7-1 semi-final defeat to Germany at their home World Cup four years ago still weighing heavily on their minds. Yet Brazil have always been regarded as the most watchable team in world football and intend to carry on their role as great entertainers, win, lose or draw in Russia. “We cannot promise the title, but we can promise great matches,” said captain Thiago Silva this week.